Here at Daily Edventures, we’ve been devoting each Wednesday to some aspect of Windows 8 – new apps, demos and ideas about how to make it work in your classroom. Today, Laura Rahn, whom we first introduced to you as an elementary school teacher last year, really brings Windows 8 to life. Rahn was one of a select group of educators who helped to pilot Windows 8 last year. Through that experience, she gained invaluable insights on not only the technology, but also the untapped potential of her students. Rahn has been very generous about sharing her experience, whether through her blog, forums like Edmodo, or through her participation in the Partners in Learning Network. Her technology-enabled classroom projects are consistently creative and effective, like this “Finding Geometry in Geography” project, which had students seeking and documenting examples of geometry in the world around them, all using Windows 8 apps. Now transitioning to a new role teaching 7th grade English, Rahn tells us what she’s learned by diving head-first into educational technology. In today’s featured video, you’ll see her students interacting with Windows 8 technology with ease and a contagious enthusiasm. What significant event(s) have taken place in your professional life since we last heard from you? A year ago, when I was featured on Daily Edventures, I was a teacher who had discovered Microsoft Partners in Learning and was pushing forward in finding new ways to integrate technology and 21st century skills into my classroom through my own personal professional development. I was excited and gathering any bit of information that I could, to use with my fourth graders. Here I am a year later, still doing that. The big difference is that because I asked a question and followed a dream, I was able to spend this last year in a 1:1 computing classroom with my students, as one of the only elementary schools in the country piloting Windows 8. I created this pilot program at my elementary school for two classrooms, partnering with Loudoun County Public Schools, Microsoft, Dell and Intel. What I witnessed during this past year wasn’t just about professional development for myself, but about what students are really capable of if they are given the tools and the opportunities! What is the most significant change in the world of education you’ve observed in the last year? Why? I really don’t know if I have seen a “change” in the world of education during the last year, as much as I’ve watched the world of education continue to move forward with the many new and innovative tools and ideas that are available to educators. Teachers are now able to sit in the comfort of their own homes or classrooms, and search for new ideas or explore uses for new tools in the classroom. I like change, and I love to try new ideas in my classroom. The world that we live in now provides so many opportunities for educators to create change in their classrooms and schools, and to explore new ways of teaching. What have you learned in the last year as part of your professional development that you would like to share with our readers? During the past year, I entered into the world of social media with my students. We spent the past year blogging on a regular basis using Kidblog, and also collaborating and communicating with Edmodo. I think it is important for not only educators to use social media to benefit themselves, but to also explore using social media in your classroom with your students. By providing an authentic audience for a student, he or she sees learning as real and not just something to hand in to the teacher for a grade. That learning opportunity then becomes exciting, and the students look forward to sharing what they are doing in the classroom. The quieter students have also responded well to blogging and communicating with their peers online. Students enjoy these “real world” experiences, and have taken more pride in their work, because they know that a wider audience will be seeing it. What are you most encouraged about in education right now? I think one of the most encouraging things in education right now is the opportunity for professional growth for educators. A year ago, I said that you shouldn’t wait for professional development to come to you, but go find it. If a teacher wants to improve their practice, or find a new idea, there are a wealth of places that they can. There are many educators that aren’t aware of the benefits of social media, but I think that is because they haven’t explored the educational aspect of using these tools. I know that I have the world at my fingertips, and there are experts in every corner of that world that can offer advice or give me ideas for ways to improve my teaching. Many more people are realizing that sharing is good, and asking for help isn’t bad. I recently had the opportunity to present at our local technology conference, ActivLoudoun Plus, and was overwhelmed at the outpouring and sharing of technology ideas that are available just within our school district. My hope is that I will continue to find educators to share and network with, and my Professional Learning Community will continue to grow! I can’t say that I am passionate about only one 21st century skill, because I feel that all of them are interrelated. I witnessed that in my classroom this year as I finished a cumulative Windows 8 Math project with my students. Through a project-based learning (PBL) approach, my students worked in collaborative groups to review the basic Geometry concepts and search for them within our world. They then problem solved to decide how to create an innovative digital product to share this information with their peers and the community, using technology as a tool. They had opportunities to investigate Geometry in nature and landforms, historical structures, present day architecture, and everyday items that we encounter in our daily lives. These investigations were done using digital photography, artwork, and video. Students then created Microsoft Tags/QR codes linking back to their final project video. The second aspect of collaboration was to design “placemats” for local restaurants to use with their young customers. These MATH MATS display the TAGS/QR codes for parents to scan and show their children while waiting at the restaurant, and also contain Geometric activities pertinent to the theme of the restaurant. Students were responsible for communicating with the restaurants (with supervision) and entering into a discussion about the expectations and design of these MATH MATS. The MATH MATS were produced by a local printer and distributed to the restaurants at the conclusion of the project. The results were impressive, and as I stood by the side and watched the students create, collaborate, communicate and problem solve…I realized that they were teaching each other and they were learning together. The students had the opportunity to share their projects at our local Microsoft Store with Andrew Ko (GM of U.S. Partners in Learning). The pride on their faces as they shared what they had created proved once again, if students are given the technology tools and the opportunities, they will amaze you with what they are capable of! Where do you see your professional path taking you next? I have spent the last 23 years in elementary education, and the last two to three years deeply exploring ways to integrate technology tools into the curriculum and develop 21st century skills with those students. During the past year, I decided that I wanted to explore working with another age group. I asked another question, and followed another dream… and for the 2013-14 school year I will be transferring to teach English at the middle school level with 7th graders. I am extremely excited about the new opportunities for professional growth, and also the many new and different ways that I can integrate technology tools into the middle school English curriculum. 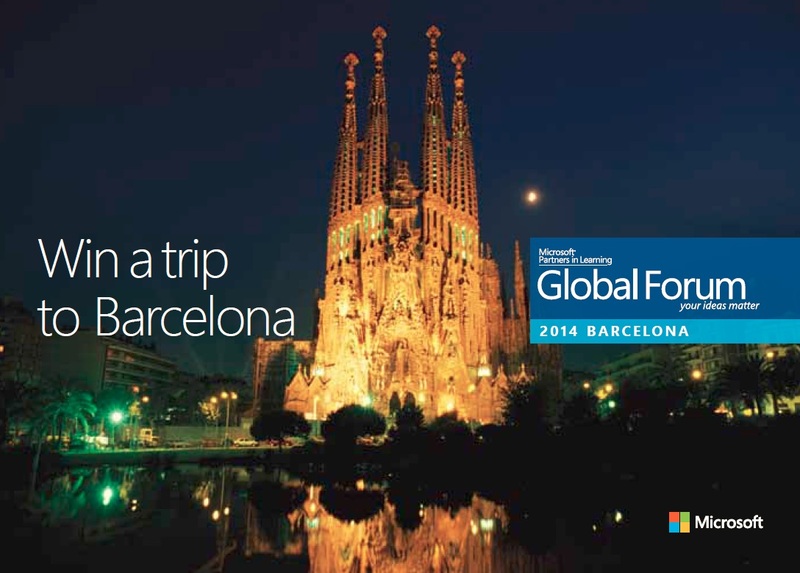 Apply NOW and join us in Barcelona! This entry was posted in Change Management and Culture of Innovation, People and tagged partners in learning network. Bookmark the permalink.